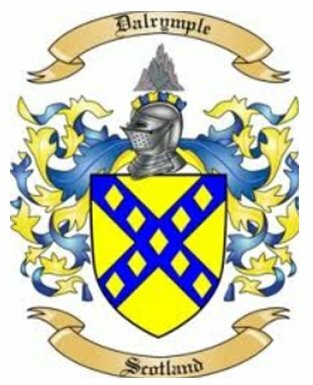 This web page contains our Dalrymple family line from Andrew Dalrymple, born in Scotland about 1682, to my grandson, Brian, who is 23 years old. I'm Daniel Scott Dalrymple Click here for more , born in Mt.Vernon, Ohio in 1939. I've lived in Wooster, Ohio since 1953. 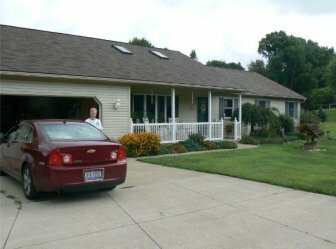 Our home near Wooster, Ohio. I graduated from Wooster (Ohio) High school in 1957. I married Karen (Karen Sue Grim) in 1960. We had 3 children, Scott, Brad, Leigh and 4 grandchildren. Karen passed away in August, 2000, just after our 41st wedding anniversary. I remarried in June 2005. My present wife, Carol (Carol Williams Hall Dalrymple), is from Morgantown WV. She was widowed with one child, Craig, who lives in Quincy IL. Carol and I enjoy our Church, lawn and garden work, I enjoy cutting and heating with firewood. Carol's family is from Morgantown - Fairmont WV area. Scroll or page down for more . . .
We are interested in our family ties in Scotland and the British Isles during the 1500-1600s. Photo is my father, Joseph M. Dalrymple, born 1910, Knox Co, OH, d-1980. My father, "Joe", was one of seven children, a self-employed electrical contractor most of his life. Married Dorothy Ross. This photo was taken, possibly by one of his brothers but more probably by his friend Walt Hazlebaker. It was taken in Montana during one of dad's yearly elk hunting trips. My father's family were farmers, as farmers they utilized firewood for their winter heating. My father always enjoyed a wood stove to supplement his home heating and taught me to enjoy firewood as an additional home heat. I enjoyed cutting firewood with my father almost every Saturday during the '50s, '60s and '70s. He taught me about trees and how to properly trim a woods, making it more productive. I've supplemented my own home heat with a woodstove for over 50 years. Firewood is a renewable energy resource like wind, solar and hydroelectric power. We need to use more renewable energy and less oil, gas and coal in the future. Heating with wood can be a part of the solution, provided the wood is burned efficiently. Click here for my firewood facts page. Brice was a son of Andrew Dalrymple, b-1804, Sussex Co, NJ, m-Mary Ann Wolfe. Andrew was a son of Stephen Brice Dalrymple, b-1777, Sussex Co, NJ, m-Susanna Struble. Stephen was a son of Andrew Dalrymple, b-1746, Morris, NJ, m-Eleanor Rickey. Andrew was a son of Joseph Dalrymple, b-1714, Morris, NJ, m- Jane/Jeane Boyle. Joseph was a son of Andrew Dalrymple, b-1682 in Scotland, m- Janet Kirkbride. Dalrymple is a village in East Ayrshire Scotland. It is at the westernmost point of East Ayrshire. The village of Dalrymple, Scotland is in the Doon Valley, on the north bank of the Doon River. The name Dalrymple comes from the Scottish Gaelic language, meaning "flat field of the crooked pool or river". The village is relatively modern, although the parish and church of Dalrymple are older. When the community was first established around 1800, there were two streets, Main Street and Garden Street. The village grew slowly until the late 20th century, when council housing was built to house families from coal-mining villages in the area that were suffering an economic decline. Keywords and associated family names: Dalrymple, Dalrimple, Grim, Williams*, Hall*, Straum, Finley, Banbury, Couse, Knoph, Cozad, Tingley, Rhinehardt, Douglass, Lewis, Waldorf, Harris, Banbury, Cornish, Bellot, Blaine, Moore, Beatty, McFarland, Bolk, Pelletrau. Click here to go to our MAIN Index page. From here you will have access to all of our web pages. We have a page on our favorite sailboats of Lake Erie, our old Cal Yachts homepage, muzzle loading ballastics, my links to everything page and even a page about firewood. How our ancestors cured their ills.Dan's Herbal ole fashioned remedy page. I tried to include many of the herbs that our ancestors used to treat their aches and ills. There are tips on dandelion, burdock and even what leaf to apply when the mosquitos roll in. How our ancestors hunted.. Dan's Muzzle Loading Ballistics page. How much powder did grampa use to bag that Thanksgiving turkey? Who cares? Sombody might... It's all right here. This page last updated on November 05, 2015.